It’s unbelievably early on a Friday morning and I’m being bundled into a car, given a blindfold to put on and driven... somewhere. After hours in the car, during which no-one gave away any information, we arrive... somewhere. The sun is coming up and the first details of my challenge are revealed: can I survive and navigate alone in the wilderness, and return to my starting point safely, with only tech to help me? Well, I won’t actually be alone. I’ve got a buddy photographing this expedition, documenting it on the new Fujifilm X-E3, and who I’ll yell at for help if I end up in a 127 Hours-type situation. But he’s been told not to help me with this task. Great. The team hands me a pair of Salomon X Ultra Trek GTX hiking boots (miraculously in my size), an Arc'Teryx Beta AR Jacket and an Icebreaker Cool-Lite Mira Pullover Hoody. I assume I’m at risk of getting wet, because they then give me a Patagonia Stormfront Backpack .. And there’s more tech goodies inside. I’m starting to feel apprehensive, so the team finally tell me the final part of the challenge: I need to find my way to the top of the huge mountain in front of me, and back down again, but on a completely different route. Going through my backpack full of tech, I first pull out a Black Diamond Revolt headlamp. It’s light out, but only just, so I pop it on. The Revolt has multiple LEDs for different levels of illumination. I don’t need the ones designed for better navigation at night (I hope I’ll be back down by then!) but it’s helping to make things clearer now. Next out of the bag is a Handpresso Auto Capsule portable coffee maker. Whether you consider this to be true survival gear probably depends on your daily need for coffee. I’m pleased to see it, and could do with a coffee right about now. The Handpresso Auto Capsule is very easy to use: just plug it into your car’s 12/24-volt socket, add water and a capsule, then watch it brew a tasty espresso. Like some kind of tech magician, I next pull a DJI Mavic Air out of the bag. A drone? Really? When I ask how a selfie drone is supposed to help me climb a mountain, the team says it has features that might be useful to me. At this point I still have no real idea of where I am, but next out of the bag comes a big, heavy-duty looking phone. Now we’re cooking! It turns out that this phone is actually the Land Rover Explore Outdoor, purpose built for adventuring and exploration. I turn on the phone (mercifully, the team has charged it fully) and the GPS tells me that I’m in Snowdonia. So yeah, all I need to do is find a route that will take me up Snowdon, and another to come back down again. Simple, right? Surely the easiest way for me to do this is by following some other people up, but the team quickly says that’s against the rules. Also, no one else is foolish enough to be around at such an ungodly hour, so it’s pretty quiet here at the moment. It’s okay, though, because the phone comes loaded with ViewRanger, which gives me access to premium Ordnance Survey mapping. 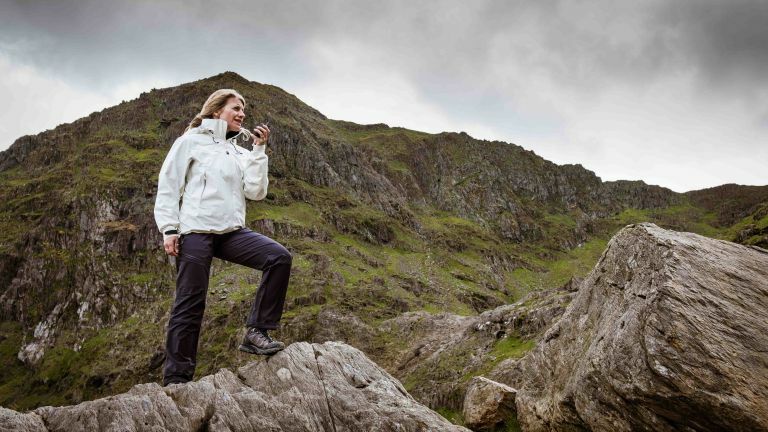 I search for Snowdonia on the phone and, quick enough, a range of routes appear on screen. I decide upon the PGY track going up, and guess I’ll figure out what track I’ll use to come back down once I get to that point. I’ve also been given some Binatone walkie talkies, but these are more of a safety gadget for staying in touch with the team in case anything goes wrong. After a quick look at a few tutorials on how to get the DJI Mavic Air up and running, its usefulness dawns on me: I’m some way off from the trail I want to join, and can’t see how I’m going to get over to it, so I send the Mavic up for a reccy. Being able to see (via the drone’s 4K UHD camera) that the path over one rise is too rocky saves me time. Using the Mavic again, I’m able to scout out a gentler path further along. With the drone’s job done for now, I fold down its propellers and stuff it into the Patagonia backpack. The sun is trying to come out and it’s relativity warm, so off I go. But I soon realise that I don’t have a full water bottle with me. Luckily there’s one more gadget in my backpack of tricks: a LifeStraw Go water filter bottle. The LifeStraw Go uses a two-stage filtration system to remove bacteria and protozoa, so I can fill it up from natural sources (rivers, lakes and such) and drink without worry. I top it up from a nearby waterfall, down half, then re-fill it to get me to the summit. A few hours in and I’m nearing the top, as evidenced by the increasing cold. The Welsh rain appears around this point too, so I pull on the Arc’Teryx jacket and all gadgets apart from the waterproof phone goes into my pack. Reaching the summit, I decide to check in with the team back at the start. The Binatone Terrain 850 has a range of 8km, which is just as well as I’m around 7km away from the nearest team member. The weather is turning ever-colder and windy, so after a decent rest I’m eager to get down. Out comes the Land Rover phone again to help me work out what the fastest trail. I find something promising but have trouble working out where to join it, so I wander around with the phone out in front of me, like an orienteerer with a compass. I’m soon on the trail. Halfway down I also have the chance to refill my LifeStraw Go from a stream. I radio in again to tell the team which trail I’m on, so they can see me coming (and give me a guard of honour). The terrain gets really rocky and slippery around here, so I’m glad to be wearing Salomon’s firm-grip boots. Arc’teryx’s jacket is also holding up well, and the Patagonia backpack is still keeping my gadgets dry and protected. Be prepared for adverse weather when you're out in the wild by arming yourself with Patagonia's 30L backpack. A fully waterproof design will ensure your outdoors gear, gadgets and your snacks stay dry. Patagonia has approached the Stormfront's weight dispersion with supreme comfort in mind, especially for those longer treks. This is done via a removable waist strap, plus padded shoulder straps to amp your comfort. When you're done adventuring, you can use the Stormfront as a stylish winter commuting backpack, keeping your laptop and other tech safe inside its series of dedicated inner pockets. Why lug around litres of tap water when you can fill up from streams, rivers, lakes and even puddles as you're adventuring through the wilds? Our thoughts exactly, which is why we called upon the Lifestraw Go to provide us with clean drinking water whenever we needed it during our survival challenge. Fill it up from any clean-ish natural source and the Lifestraw Go's two-stage filtration means you’ll sip only healthy water through the straw, filtering out bugs and other nasties. No power required, and there's no iodine or similar chemicals that can leave a weird taste or discolouration. There's much to love about this dedicated phone for outdoors types. It's IP68 rated for one, so it'll be fine in a downpour. The exterior casing is also super-tough, providing ample protection should you accidentally drop it on some rocks, and there's a carabiner for attaching the phone to your belt or backpack. This Android phone comes loaded with OS maps, so you won't have to worry about trying to get signal, then chewing through data, to download the one you need. With a range of up to 8km and 968 channels, plus noise cancellation, these walkie talkies help you stay in touch with base camp no matter what. You can also catch the weather report via the built-in FM radio. Although not waterproof, they are drip-proof, so should withstand the odd light sprinkling of rain. The channel scan function is handy, enabling you to search for other members of your party who are on the same channel. There's also a talk confirmation (a Roger beep), helping you to know when the other person has finished speaking. Bright as hell (up to 300 lumens) and with various LED settings tailored to different times of the day or night – a red LED helps boost your night vision, for example – this Black Diamond headlamp helps you see clearly in all situations. The ReVolt is now completely waterproof, so you can wear it in the water and during nighttime downpours too. A three-level power meter shows how much power is remaining, with a full suite of settings available, including strobe and night-vision. Brightness Memory is handy, as it enables you to turn the light on at the specific brightness you want, rather than the headlamp reverting back to full power each time you switch it on. Immense traction and complete waterproof protection make these one of the best hiking boots for tackling slippery trails in winter – and throughout the year. The fit is near-perfection too, thanks to a Heel Strap and adjustable Lace Locker. The GTX boots are ideal for quick hiking, helping you move swiftly across an array of terrain when speed is of the essence. Because they sit snug above the ankle, they'll prevent surface water from finding its way into your socks. Laugh in the face of wind and rain with this surprisingly stylish unisex jacket. The Beta AR is lightweight and breathable, offering hip length coverage (so no exposed, soggy waistbands) and a built-in DropHood that'll sit snugly over a helmet. It uses Gore-Tex to provide enhanced protection from the elements, with an internal collar providing further shelter during stormy weather. A series of zippered pockets will keep your tech and essentials safe from the rain, too. The Arc'teryx Beta AR is a truly versatile technical jacket for hitting the mountain, for general exploration of the great outdoors, and even for power-walking your way through nature in winter. Ok, so this may seem like an odd choice for a survival tech feature, but it saved us a lot of time faffing over which route to take. And because the DJI Mavic Air weighs nothing, and folds down into a backpack, we didn't resent taking it along. If you're unsure which path to take when adventuring in the wilds, and need a better vantage point to assess things from, send the Mavic Air up to take a look for you. It'll show you, via its gimbal-mounted 4K UHD camera, what you need to see, live-streaming footage to the DJI app.